Trout, Ebersole & Groff, LLP is pleased to announce that Tiffany Bender, CPA has earned the professional designation of Certified Construction Industry Financial Professional (CCIFP) from the Institute of Certified Construction Industry Financial Professionals. This prestigious certification indicates that Tiffany has completed the necessary education and experience requirements and has passed the written CCIFP examination. Tiffany's accomplishment demonstrates her commitment to excellence in the construction industry and continuing education. 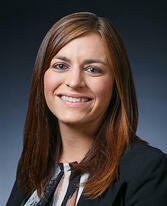 Tiffany joined Trout, Ebersole & Groff, LLP in 2013. She graduated from Millersville University with a Bachelor of Science degree in Business Administration with a concentration in Accounting. She currently serves on the firm’s Construction, Governmental and Employee Benefit Plan Practice Groups. Tiffany is also an active member of the Business Development Committee. As an Audit & Attest Supervisor, Tiffany handles all aspects of audit and attest services, including performing financial statement audit, review and compilation procedures, as well as financial statement preparation. We wish to congratulate Tiffany on this important milestone in her professional career.